Does birth spacing matter for long-term outcomes? Intervalles intergénésiques: quelles conséquences sur le devenir des enfants? In a study recently published in the journal Demography, my co-author Martin Kolk and I examined whether the length of spacing between births is related to long-term cognitive, educational, and socioeconomic outcomes (Open Access paper available here). To put it simply, we wanted to investigate whether the length of time between births (birth-to-birth intervals) is related to how cognitive ability develops, how people perform in school, how long they spend in education, and how they perform in the labour market. Previous research has shown that short birth intervals (less than 2 years), and longer birth intervals (greater than 5 years), are associated with an increased risk of pre-term birth and low birth weight. Other studies have shown that short birth intervals are also associated with worse performance in high school, and a lower probability of going to university. There are several good reasons to think that birth spacing should matter for long-term outcomes. These can broadly be grouped into biological explanations and social explanations. Being born after a very short birth interval might be bad for the child because his or her mother did not have enough time to fully recover from the previous pregnancy – this is called the maternal depletion hypothesis – and could be expected to increase the risk of poor birth outcomes such as preterm birth and low birth weight. 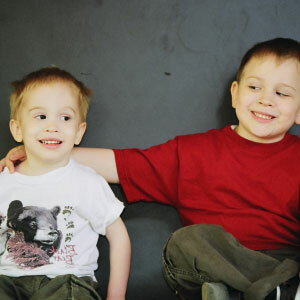 Short birth spacing might also imply that the mother did not breastfeed, or at least did not breastfeed for very long. Since breastfeeding is associated with long-term benefits, missing out on this could be disadvantageous. Having closely spaced siblings might also mean that the resources and time that parents have available to invest in each child is diluted. In our study we used data on the full Swedish population taken from government administrative registers. This is an extraordinary resource that allows us to link individuals to their parents and siblings, and to follow those same individuals from birth through the educational system and into the labour market. The specific outcomes that we examined were high school grade point average (GPA), IQ, the total number of years spent in education by age 30, earnings around age 30, being unemployed around age 30, and receiving government welfare support around age 30. To study how birth spacing affected these long-term outcomes, we looked at people born 1960-1990, though the specific birth cohorts used in the analyses varied according to the availability of data on the outcome measure. We examined how the length of time since the birth of an older sibling, as well as the length of time until the birth of a younger sibling, affected these long-term outcomes. We also implemented an innovation in the way that we analysed the data: we compared biological siblings born to the same mother and father. This is important, because siblings in the same family share many similar conditions and experiences, such as living in the same house, and, critically, having the same parents. We also adjusted for several other factors that might be important, such as gender, the age of the mother at the time of birth, family size, birth order, and birth year. Figure 1 shows the results for the relationship between birth spacing and educational attainment at age 30. The left-hand panel of the graph shows the results for the length of the preceding interval (how long after your older sibling you were you born), and the right-hand panel of the graph shows the results for the subsequent interval (how long after you was your younger sibling born). The blue lines show the results from analyses where we compared siblings born to the same mother and father, and the red lines show the results from analyses where we did not compare siblings – that is, the red line shows the results from analyses where we did not adjust for all the factors that siblings share. The x-axis, on the bottom, tells us the length of the birth interval. Each of the data points indicates how birth spacing affected educational attainment relative to a reference category, which we decided would be a birth interval of 25-30 months. To give an example of how this graph should be interpreted, consider the left-hand panel. According to the ‘between-family comparison’ (the red line), if somebody was born after an interval of 6-12 months, they had spent around 26% (-0.26) of one-year less in the educational system by age 30. 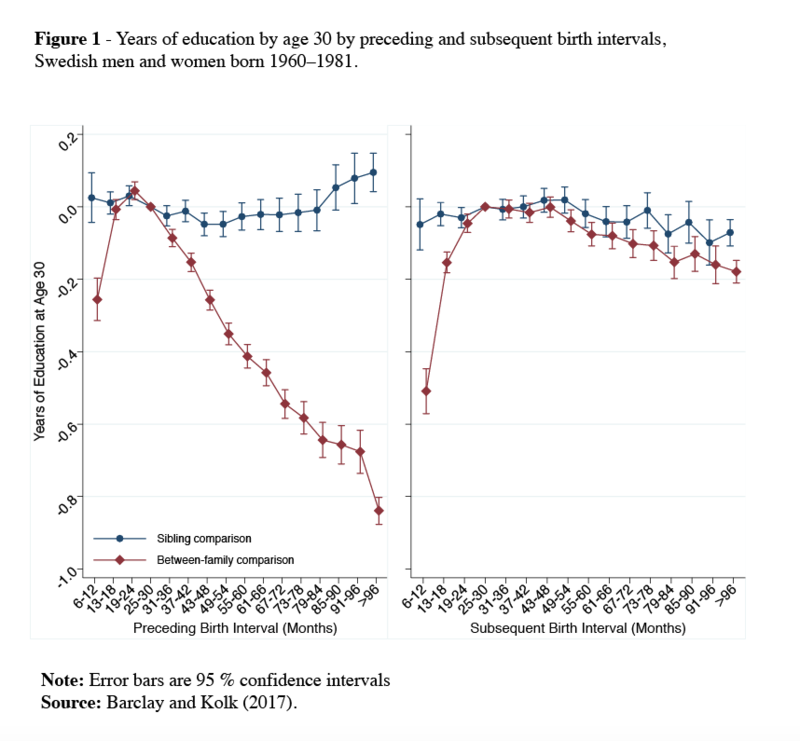 The key results here are shown by the blue lines, which show that educational attainment varies very little by the length of the birth interval. 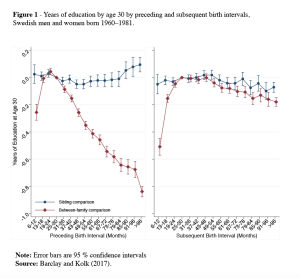 While the published paper provides many additional details, the findings from our study can be easily summarised: in contrast to previous research, we find that birth spacing does not matter for long-term outcomes in Sweden. This is true for educational attainment (shown above), as well as for all of the other outcomes that we examined. We believe that the previous observed relationship between short and long birth spacing and poor outcomes is related to concentrated disadvantage. Short and long birth intervals seem to be more heavily concentrated in families that are already disadvantaged in terms of health and socioeconomic status. Since children from these disadvantaged families are less likely to do well in the educational system and labour market, this explains why short and long birth spacing are superficially associated with worse outcomes in adulthood. Sweden is a highly developed country with excellent medical care, extremely low rates of infant mortality, relatively low income inequality, and free education. Naturally, therefore, the effects of birth spacing might be more consequential in a country where the residents do not benefit from these advantages. Nevertheless, our study suggests that birth spacing does not matter in high income settings, and we encourage researchers with data on other contexts to reexamine this research question.